China has imported more than 46 million cubic meters of logs from countries with log export bans from 2005 to 2016. Many of these imports are in violation of log export bans (LEBs) and present a risk to Chinese companies – and their down-stream buyers of processed wood products in North America and Europe – that these logs are illegally sourced. This new policy brief analyzes trade trends of these log imports to China and also assesses their due diligence risks. It shows that during this time (2005-2016), Chinese companies imported more than US$16 billion of logs from 31 countries with either full or partial log exports bans (LEBs). Logs sourced from a country with a full LEB policy are likely to be considered illegally sourced. Logs imported from countries with partial LEB policies should signal the need for additional risk assessment and mitigation actions to ensure that they did not violate the specific aspects of each exporting country’s LEB policy. 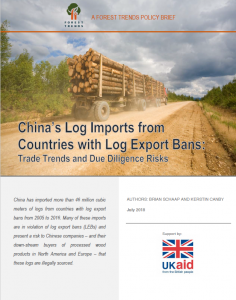 The brief concludes with recommendations for how to conduct further investigations of log imports into China from countries with log export ban policies.